Our holiday homes, located only 700 metres frm the sea, are an ideal place for chill out for the whole family and group of friends. There are 8 cosy houses for rental, each inclusive private terrace. On the fenced terrain there are relaxation zones, where you can find banquet benches and separated place for a barbeque. There are also lots of facilities for children like swing, slide, sandpit and trampoline. Furthermore, the house ensure a parking place for motorised guests. At guests' disposal there are: living room with dining area, equipped kitchen, bathroom. Upstairs there are 2 bedrooms, the one with a double bed and an exit to the terrace, the second one with 2 singe beds and double sofa bed; in each bedroom there are night cabinets, commode and sheets. The guests can also use lawn chairs and beach windbreak. Mielenko is a small seaside resort with beautiful, wide and sandy beach, situated in the middle part of the Baltic Coast. 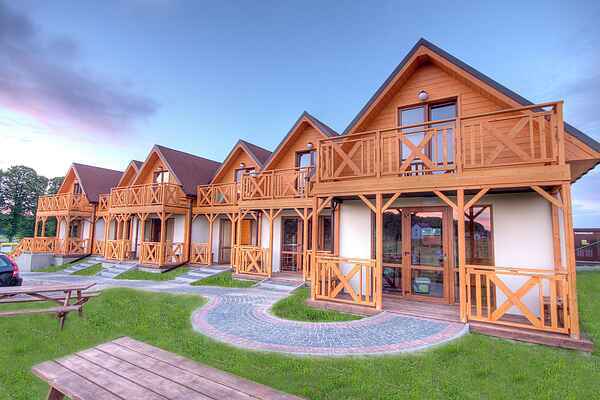 The biggest advantage of Mielenek is its location and the opportunity to spend your holidays in peace and quiet. Nearby there are plenty of fish and chip shops, gastronomic yards and local cultural attractions.